Manon Carpenter started her defence of her British Downhill Mountain Bike championship with victory in Scotland. A World Championship and World Cup winner in 2014, Carpenter lived up to her billing as favourite at Ae Forest. The 23-year-old from Caerphilly was nearly seven seconds faster than her nearest rival Tahnee Seagrave with Katy Curd third. "It was really good to get the first win in the first big race of the year," Carpenter told BBC Wales Sport. "It was quite a hard weekend. The conditions were very wet and muddy and the track changed a lot. "It looks like the World Cup next weekend [in Lourdes, France] is going to be like that as well so it was good preparation." 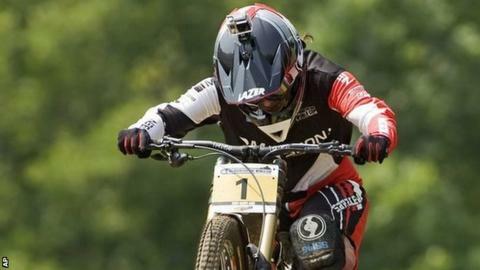 There are five more rounds of the British Downhill Mountain Bike championship, finishing in Llangollen on 18 September.